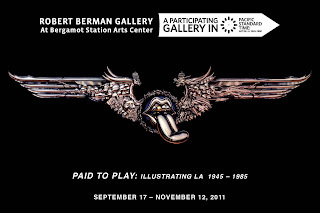 KTR Promotions in Venice Beach & Los Angeles California: Pick of the Week is Paid to Play, Robert Berman Gallery's Kick Off Exhibition for Pacific Standard Time! 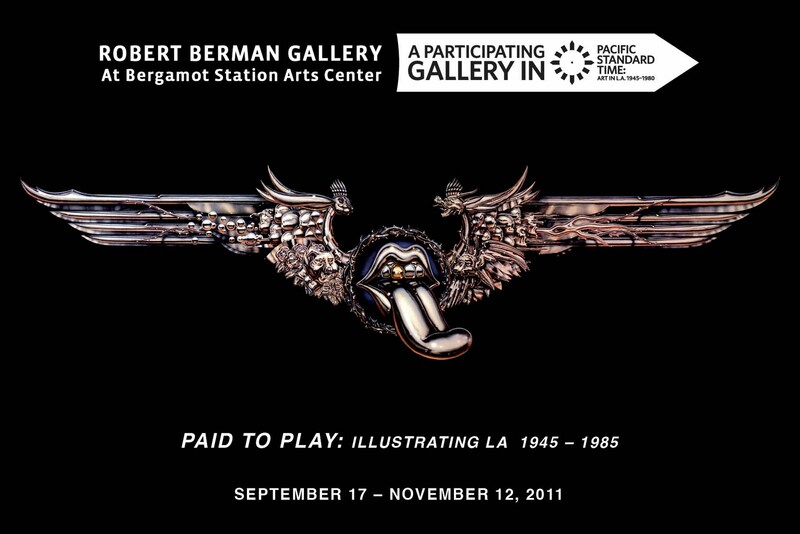 Pick of the Week is Paid to Play, Robert Berman Gallery's Kick Off Exhibition for Pacific Standard Time! So it’s the middle of September already…how did that happen? 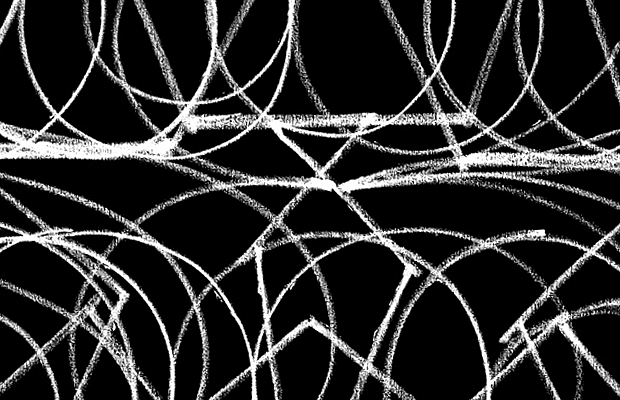 Geez…Don’t miss all these great art openings this week. 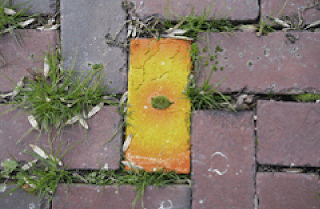 My Pick of the week has to be The Robert Berman Gallery’s kick off show Paid to Play, which is the first of several exhibitions participating in Pacific Standard Time. 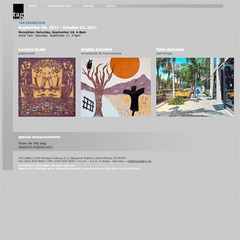 Pacific Standard Time is an initiative of the Getty Foundation. 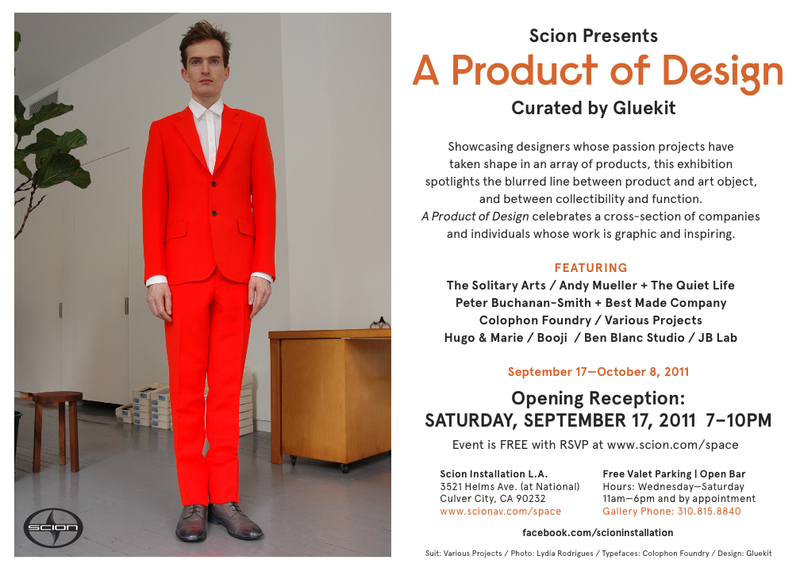 For the next six month, galleries all over Southern California, some officially chosen and some jumpin’ into the act will be featuring these iconic artists who were responsible for creating what we all know as the LA Art scene today. See below under Saturday Events for more details. 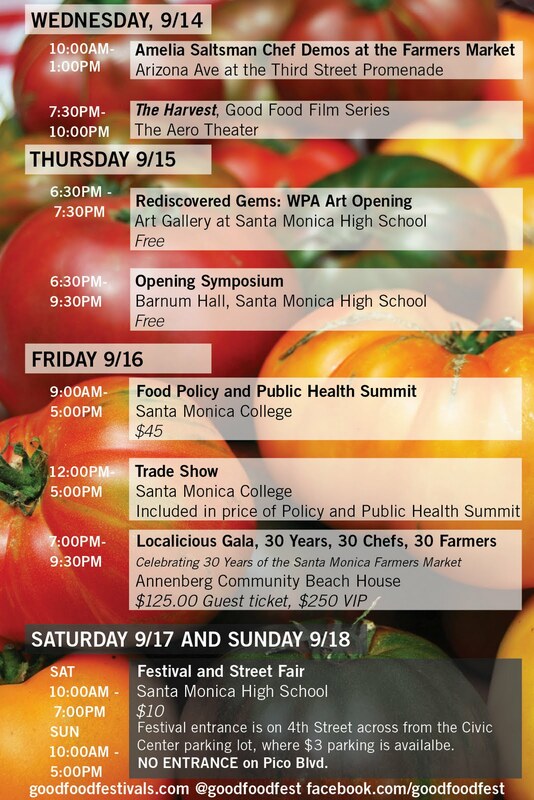 It’s the 30th anniversary of the Santa Monica Farmers Market! 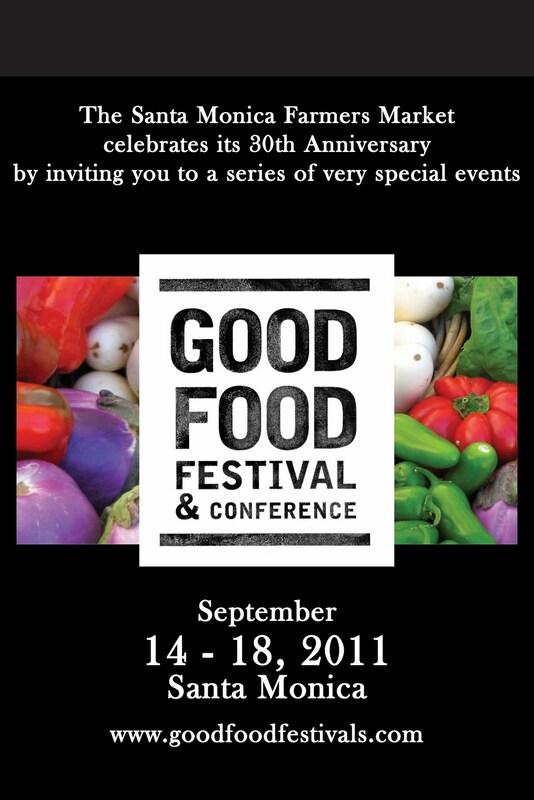 This is also the kick off for an all week food festival…Yum! 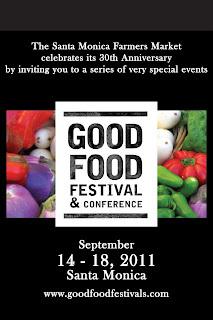 The Good Food Festival and Conference starts today and will kick off at the Santa Monica Farmers Market. Amelia Saltsman will be doing some chef demos from 10:00 am (you heard me) till 1:00 pm. 10 am – 1:00 pm. If you are into music, Guitarology at the Melody Bar & Grill (9132 S. Sepulveda Blvd., 90045) offers some fantastic players from 8:00 pm till 11:00 pm. Shawn "Fingers" Fleming is guest hosting. Guitarology has become a musical haven for incredible musicians. Get there early-reservations suggested 310 670-1994. 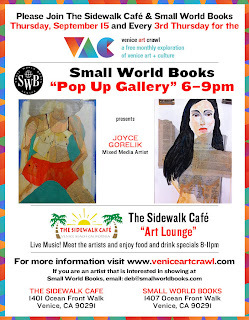 Lots going on in Venice tonight……The Venice Art Crawl, a monthly event that continues every third Thursday of each month in Venice is back in full swing. It runs from 6:00 pm till 9:00 pm, however, some events go later. 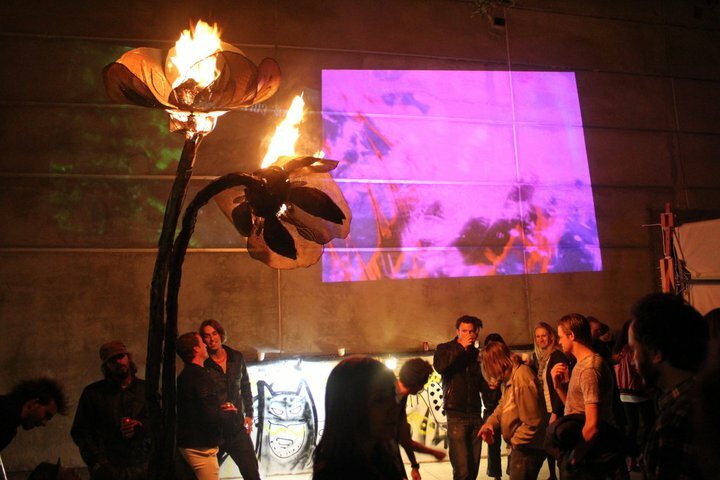 The summer months have infused new energy into this art event. This Art Crawl was inspired by the very successful Downtown Art Walk. . VAC celebrated its first anniversary last month and gets better all the time. You may want to start at Whole Foods (Rose and Lincoln), then re-park the car, or bicycle, down towards the beach. 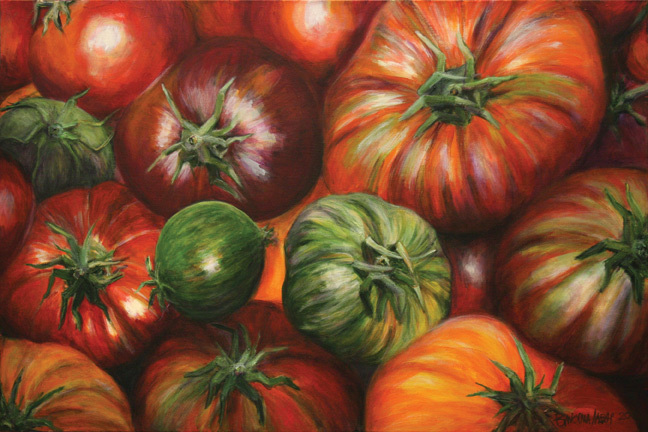 Whole Foods celebrates its third anniversary along with the Venice Art Crawl tonight starting at 5:30 pm. Local Artist Francisco Letelier & the band Curious Blue will be performing. Celebrate with a piece of cake! 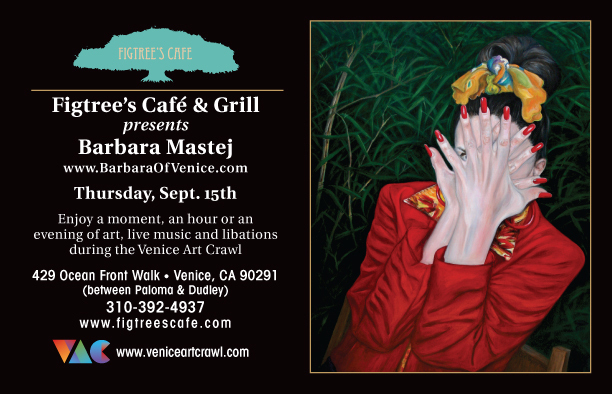 This Thursday, Sept. 15th, Figtree’s Café presents Venice painter, Barbara Mastej in a solo exhibition from in 6:00 to 9:00 pm. Enjoy complimentary wine and appetizers, and live music. If you want to have dinner, you’ll receive 10% off (on food only) from 6:00 to 8:00 pm. 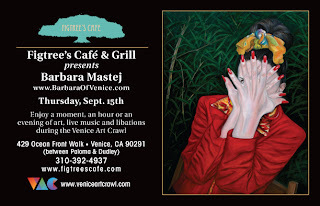 Stop by Figtree’s Café for the Venice At Crawl, this Thursday, September 15th from 5:00 pm till 9:00 pm. Figtree’s Café is known for their healthy delicious food, located right on the Venice boardwalk at 429 Ocean Front Walk Venice, at Paloma Ave, two blocks south of Rose. Figtree’s has been voted the best restaurant on the boardwalk since 1978. Figtree’s has a wonderful happy hour, Monday thru Friday and also has FREE delivery. 310 392-4937; www.figtreescafe.com. Stop by Treeman’s place. 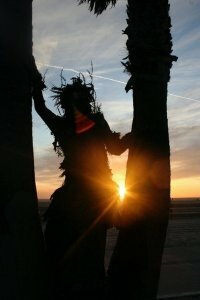 You may have noticed Treeman, gliding through the streets of Venice, a true walking sculpture/art installation. Treeman is adorned with an incredibly life like tree costume, complete with leaves. Each Art Crawl blockbuster movies are shown on a large screen on the boardwalk at treeman's art garden. Don’t miss the guided backstage tours. Located south of Dudley, right next to the Venice Bistro). 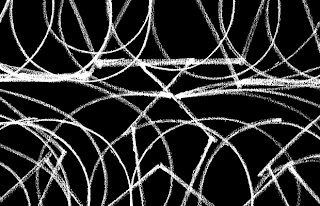 Then at 701 Ocean Front Walk, Loft 3, catch Jason Moore: Controlling Chaos. This is a new one….so I have no idea! Check it out. Definitely stop by this one, which tends to start later at 811 Ocean Front Walk. Dogtown Artists United has taken over this historical house on the boardwalk after 5 years of being closed, for one-night at the Venice Art Crawl. Featuring music, live video, DJs, visual arts, installations, I love that art has reawakened this house. 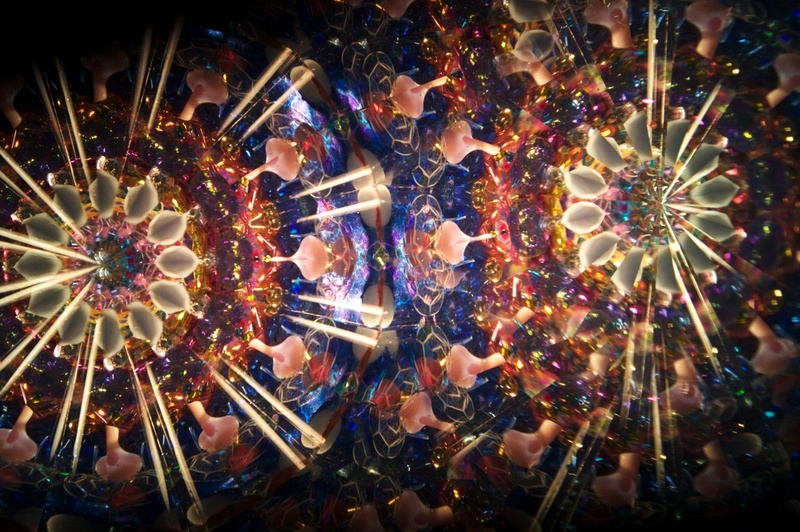 Just back from Burning Man, Tim Thompson will display his "Space Palette", an interactive sound installation that was featured at Lighting in a Bottle and Burning Man 2011. Also visual artists include Daniela Arbizzi, Chango, Alex Ermakov, Mark Lo Porto and more. 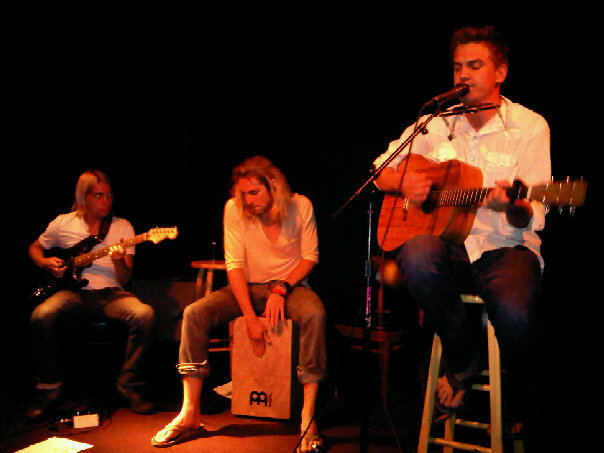 LIve music too. Venice Breeze Suites located at 2 Breeze Avenue offers a show in room 101. If I didn't know these people, believe me I wouldn't be going into a random hotel room. But they're cool! Hey I'm a New Yorker, I don't trust anyone. Venice Breeze Suites have been part of VAC since the beginning. 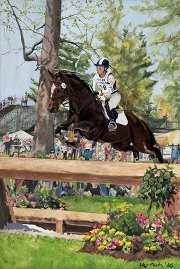 So, come enjoy paintings, prints and ceramic plates of horses, all on display in Suite 101 by artist Lizi Ruch, Designer and Owner of Artfully Equestrian. One more thing…you better like horses. Ocean Blue (1313 Ocean Front Walk) is excited to be part of this month’s art crawl and will feature several artists. There will also be live painting and live music, wine, beer, refreshments and snacks. Artists include, Grant Buckerfield, Yoshi Hashimoto, Ray McCray, Sona Mirzaei, Rachel Rubenstein and more as well as Live music with the Geoffrey J. 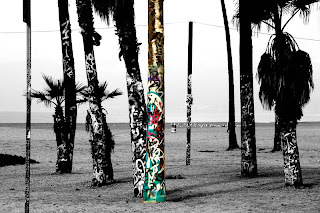 Photographer, Yoshi Hashimoto will be there and have his Venice photos on display. 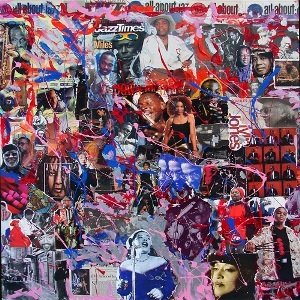 Artist Ray Mc Cray (image, to left) works with a verity of media to construct abstract and representational collages. Contemporary artist, Sona Mirzaei is a true visionary and her passion for art transcends the competitive nature of the international art scene. 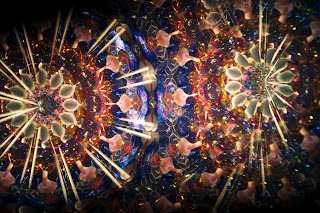 Sona, a very talented woman, sincerely desires to help others appreciate the beauty and potential of their own surroundings by adding unique artwork that complements their individual personality. 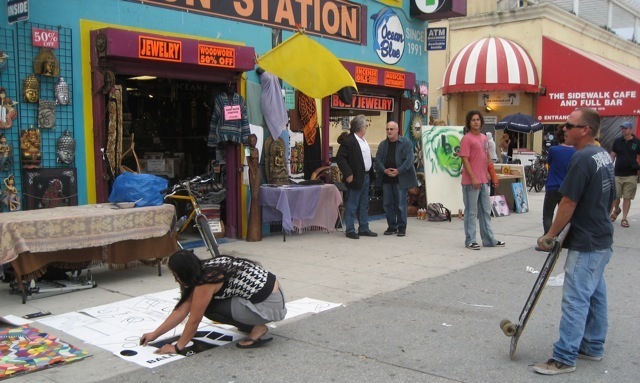 Keep walking on the boardwalk to South Venice Blvd, then hook a left and on the left side, you will find The Alkaline Water Gallery, who is showing health films. Huh? I hope they are artistic. Don’t worry they will also be art by Kathy Shorkey-Confer. 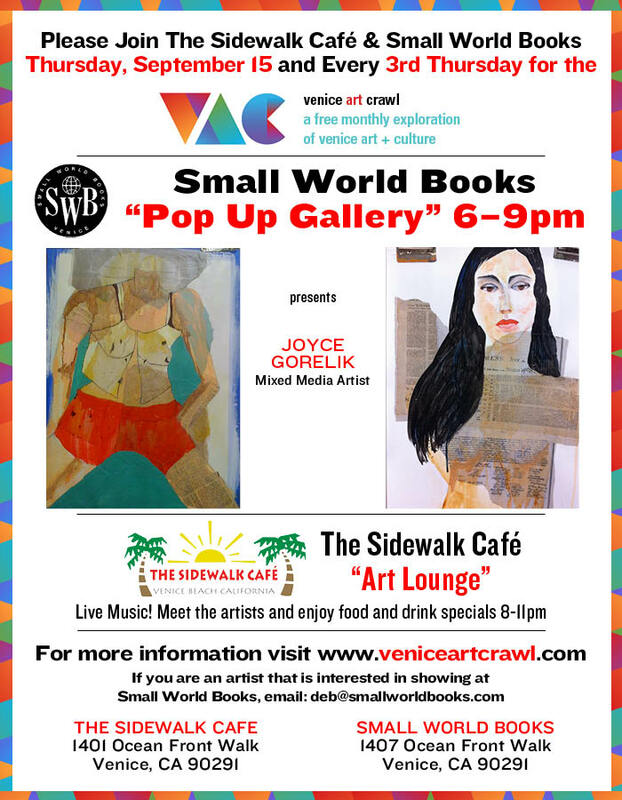 This little gallery, curated by Leila Levi will also have on display a variety of wearable art, jewelry and accessories. Snacks and wine will be served. 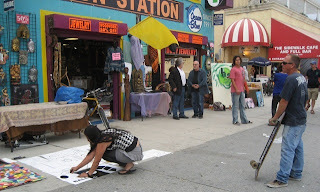 The Alkaline Water Gallery is located at 18 North Venice. 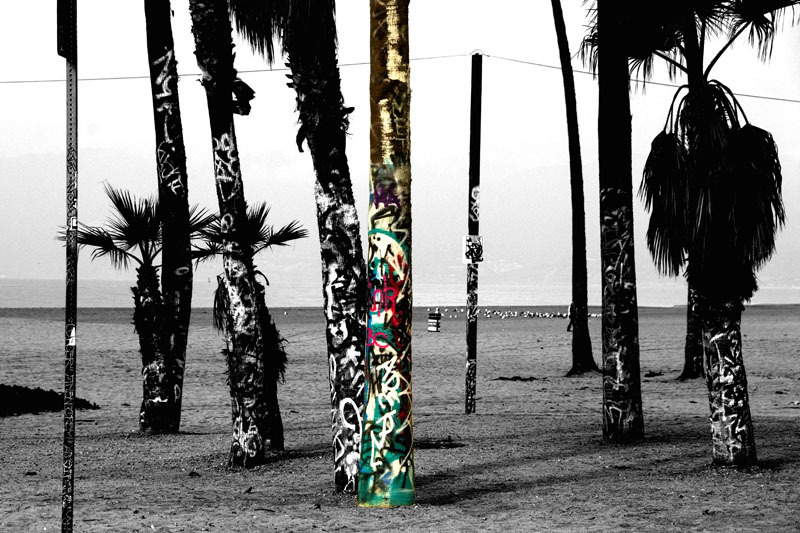 Then continue towards Pacific Ave., and stop into James Beach at 60 North Venice, for a group show. Also the Canal Club right across the street, always has a great show in their back room. Take a right and head south on Pacific, just a bit to Sunny Bak’s place who will show furniture from the cool collection of Barry Sobel,including a Bob Josten table, new work by Bobbi Bennett, Mare Costello, David Zentz, Sunny Bak (see image), Isabel Alford Lago, Marshall Carbee, Artitude (illuminating decor), the skateboard chair by David Johnson. Then back the way you came on Pacific walk towards Windward Ave, stop by the Hotel Erwin, which has two venues. You will immediately see the downstairs one, in the driveway right next to Hash Café. 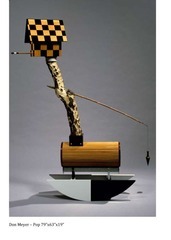 There will be several artists showing here, Kaliedo, Richard Yaker (see image) and others. There are specialty drinks on sale downstairs, but occasionally you’ll find some free wine being offered. Also you won’t be able to miss the Gas Station, located at 1697 Pacific Avenue directly across from Hotel Erwin. 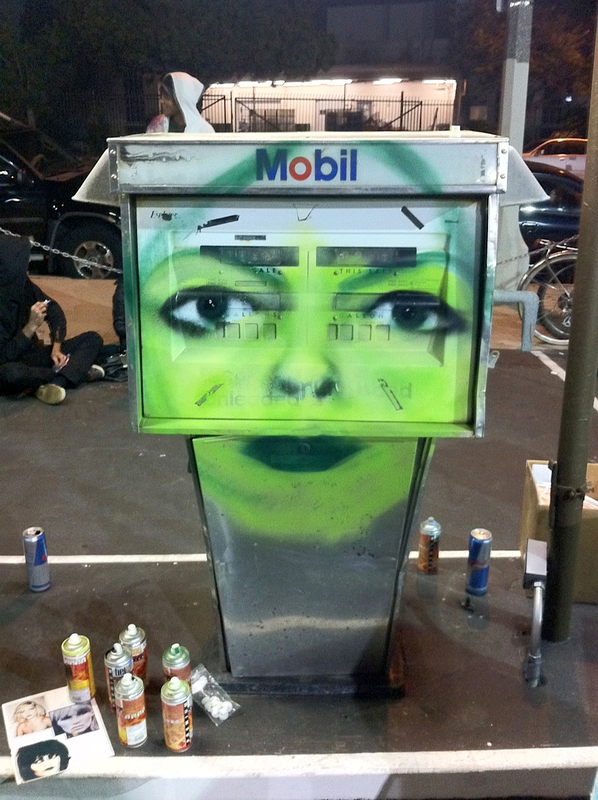 This pop up artistic abandoned gas station holds a variety of artists and had quite the buzz going on last month. 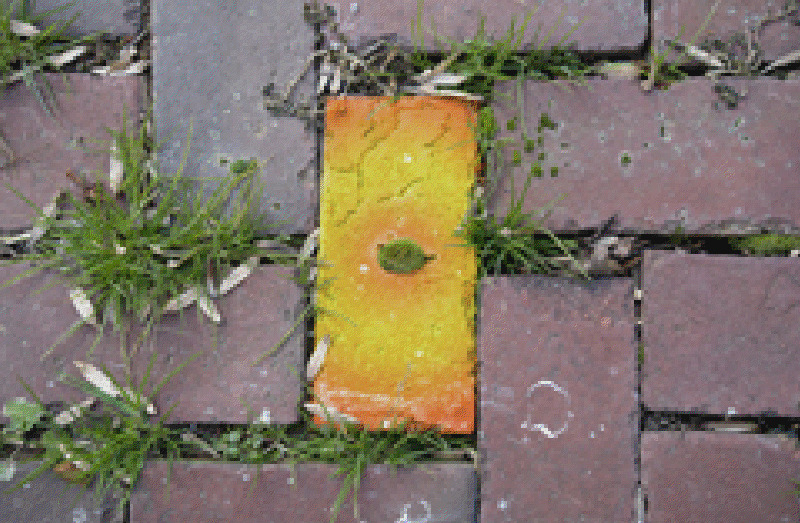 Some of this month’s artists include: Jules Muck, Amir Magal as well as several others. There are some great Art Crawl events with food and drink specials happening. 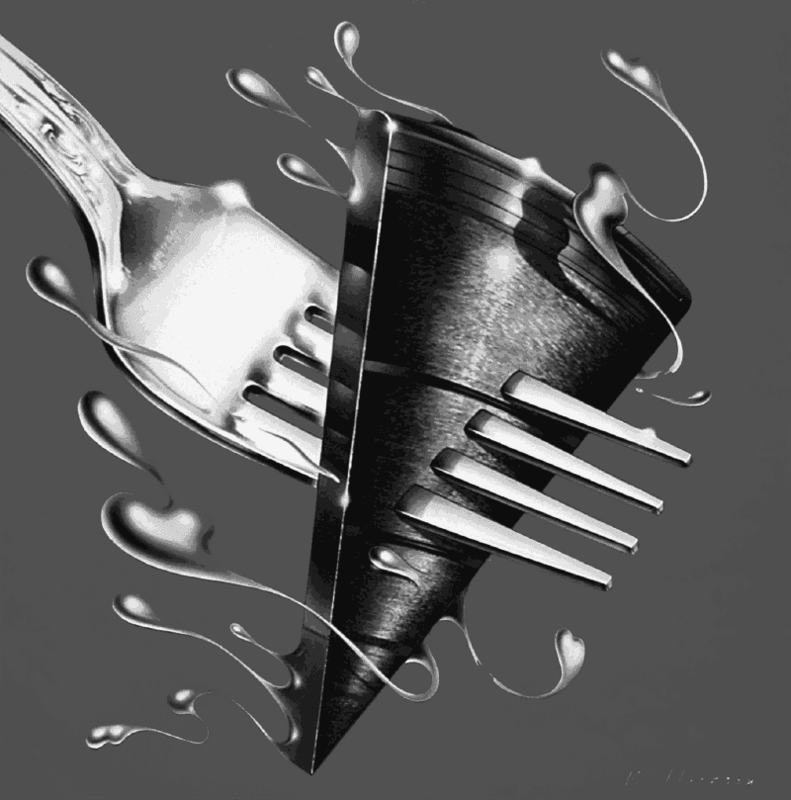 Stop in at Hama Sushi 213 Windward Ave to enjoy the art of Tracy Ray. 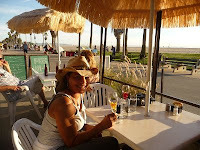 At Danny’s Venice at 23 Windward, stop in for their drink specials…Theresa Holiday is showing. Skip right across the street to the Townhouse, (56 Windward) which always has a fun scene happening…not sure about the art but you’ll have a good time. Now down at the 1320 Main Street Studios, between Westminster and San Juan, Michael Frick of Mophonics be spinnin’ some groovy trax. Street Kitchen Food Truck will be there, supplying tender vittles. 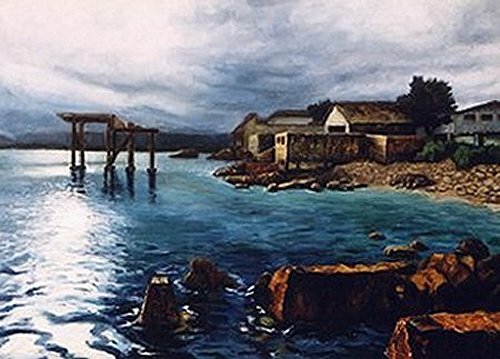 Christo Brock (see image), Grant Barbeito, Margie Stubbs, more will be hanging on the walls. This one starts a bit later, 7:00 pm…but goes till 11:00 pm. 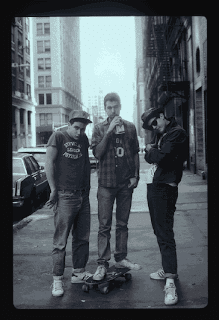 Also I heard Guy Webster's studio behind them will also be open. 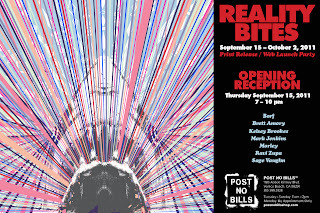 Also tonight, POST NO BILLS celebrates the Worldwide Website launch of their website. 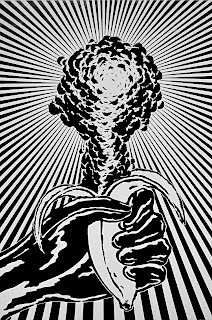 They will be offering exclusive new print editions by American artists: Borf, Bret Amory, Kelsey Brookes, Mark Jenkins, Morley, Ravi Zupa & Sage Vaughn. 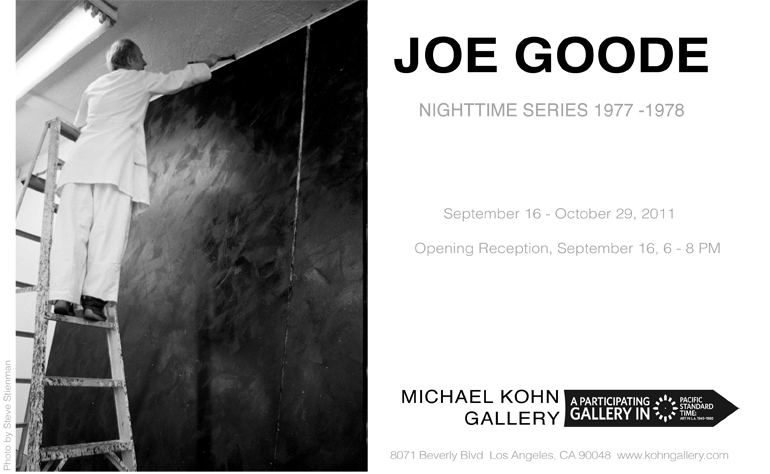 In the Beverly Hills area, the Michael Kohn Gallery presents Joe Goode as part of the Pacific Standard Time Initiative. 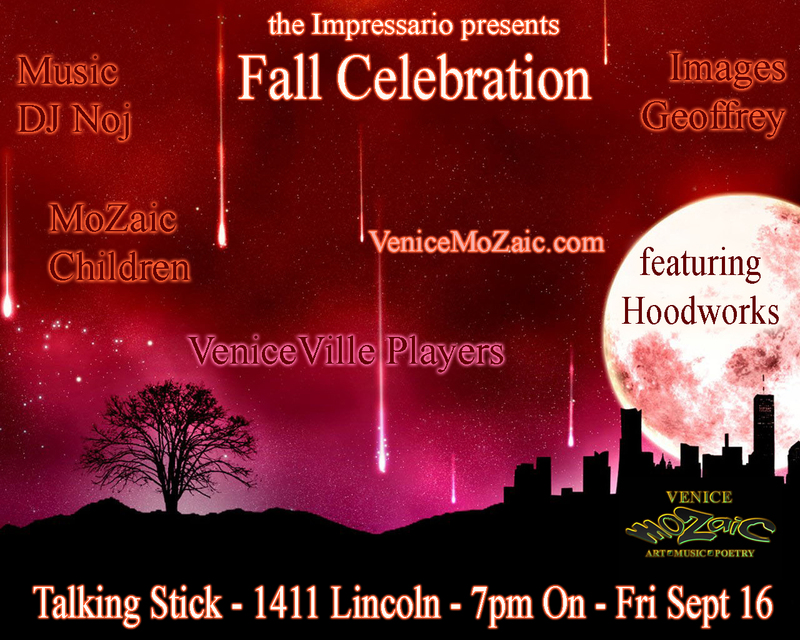 Or in Venice, stop by the Talking Stick, Venice MoZaic is hosting their "Fall Celebration" from 7pm on. There will be some awesome talent at this fun event! 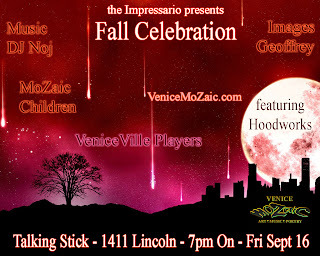 The VeniceVille Players will be sharing their individual talents during this magical party. DJ Noj keeps the groove goin’. Now before the PICK of the Week, get to Bergamot a bit early and start at TAG Gallery (D-3) which is an artist run gallery and always has wonderful events with wine and tasty treats. 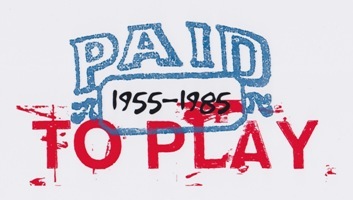 Now for my Pick of the Week…Don’t miss Paid to Play, the Robert Berman’s Gallery’s kick off exhibition for Pacific Standard Time. Paid to Play includes works by Willardson (see image, right), White, Palombi, Llyod, George Petty, Bob Zoell, Mick Haggerty, Lou Beach, Van Hamersveld (image to left), Ben Talbert, John Altoon, Jim Heimann, Mark Ryden, Dennis Mukai and others. 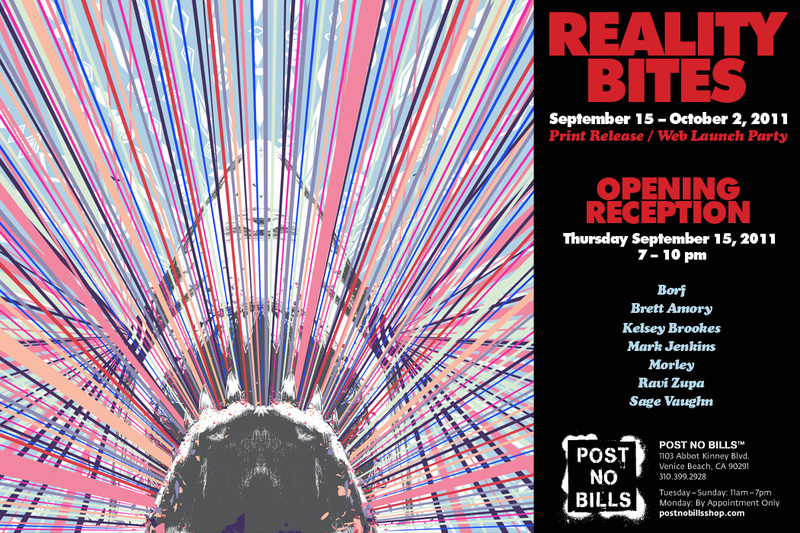 One more at Bergamot tonight….. dnj Gallery (J-1) has an opening reception for two shows. 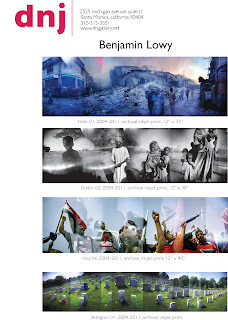 “Storylines” by international photojournalist Benjamin Lowy (see image), as well as “Plastic Rose Series” by Anne Veraldi in gallery II. Also in Venice, Altered Space Gallery presents Avian Dreams, a new body of work by LA sculptor, Aaron Kramer from 6:00 pm to 9:00 pm. Blue Five Art Space presents an exhibition of sculptures by Don Meyer entitled MORE Stuff This event runs from 5:00 pm to 9:00 pm. Or how about watching a classic movie? 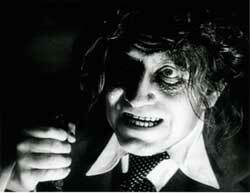 The City of Culver City presents a free film screening of Dr. Jekyll and Mr. Hyde starring Spencer Tracy at 7:30 pm. 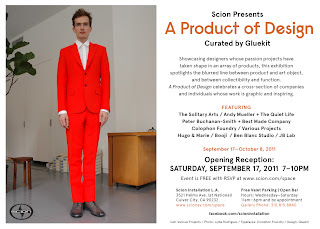 Also in Culver City…Scion Installation LA Gallery, 3521 Helms Ave off National. This one usually is fun, but definitely has a young crowd. 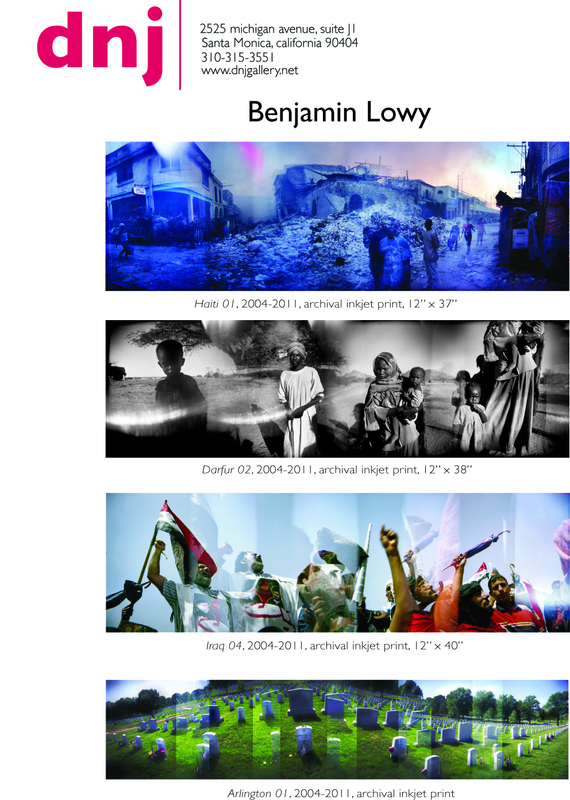 Then in Hollywood, The Loft at Liz’s offers an exhibit entitled “Fair Trade,” which is dedicated to featuring works that speak to this increasingly relevant and transformative topic. 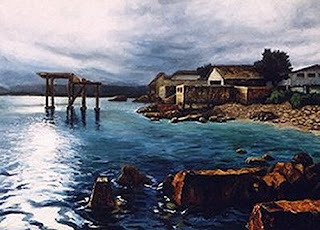 Artists have created original works in statement of fair trade practices and others will actually incorporate the use of fair trade products as their medium. Danger Dogs will be featured along with artists Stéphane Tourné, Ofunne Obiamiwe, Raksha Parekh and others. Here’s another one in the same area. It also runs late. 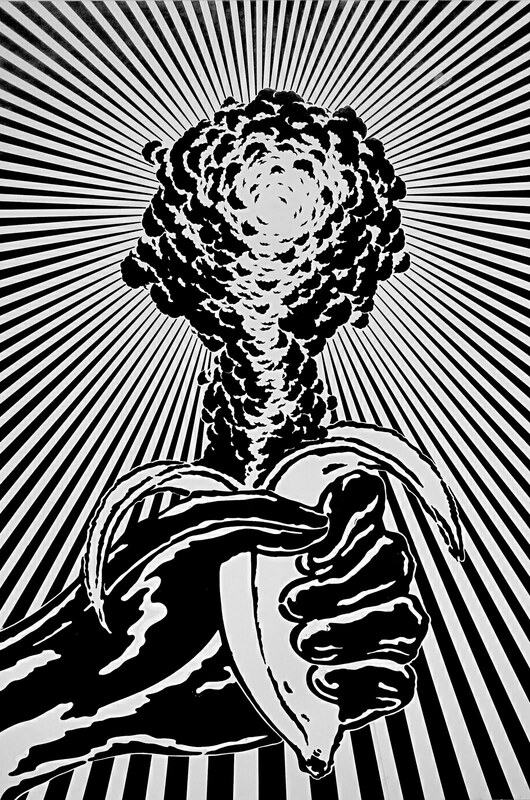 Known Gallery presents artists Eric Haze (see image), and Greg Lamarche. Opening reception 8:00 pm - 11:00 pm. 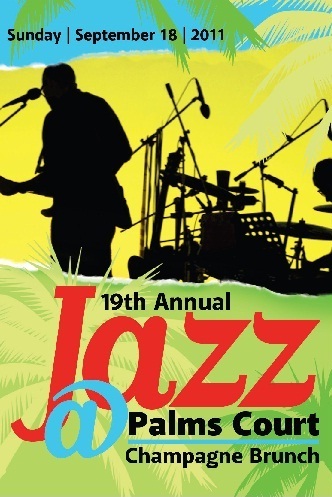 Help a great cause and enjoy some live music at the Jazz at Palms Court Champagne Brunch from 11:00 pm - 2:00 pm. Yes, It is pricy but you get a gourmet brunch while you enjoy the Richard Glaser Band. It takes place in a beautiful garden courtyard. 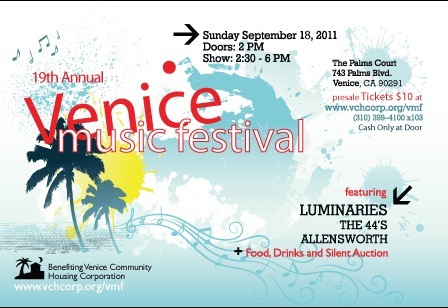 There will also be a silent auction benefiting Venice Community Housing Corporation. You must make a reservation.Tickets $125 - Please call (310) 399-4100 x 103. Don't worry, you can still help VCHC at a lower ticket price. 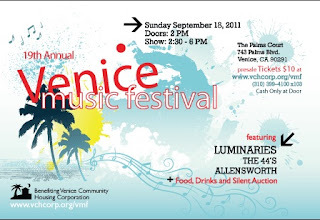 Venice Music Festival runs 2:00 pm – 6:00 pm. It all happens at the Palms Court, 743 Palms Blvd. in Venice. A celebration of Venice's unique diversity. 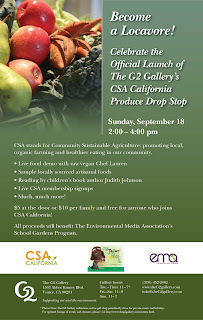 The G2 Gallery launches their new CSA California Produce Drop Stop. 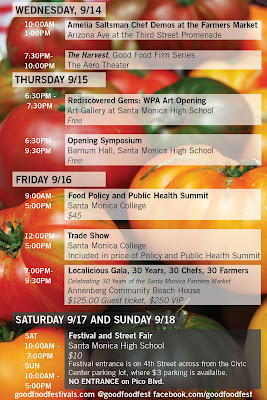 It will be a fun event, but it also promotes serious issues like healthy eating, and support for small farmers. 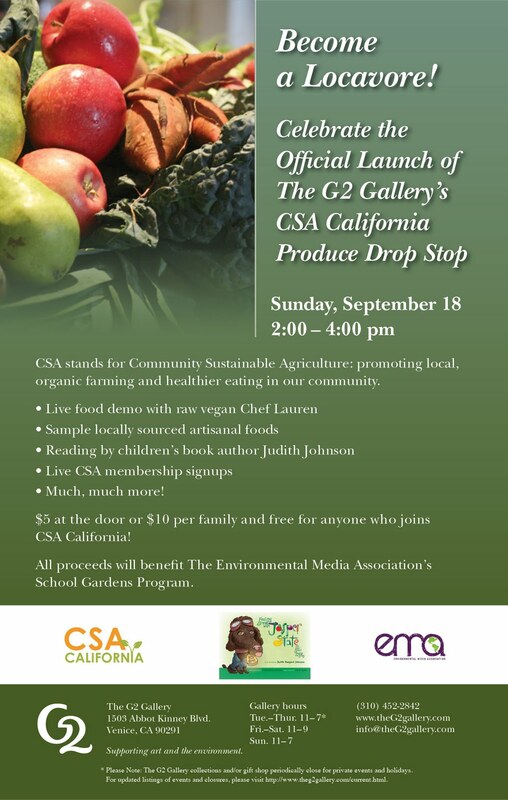 A portion of the proceeds from every box CSA California sells go to benefit School Garden Programs, and additionally, G2 will donate 100% of the proceeds from the event itself. 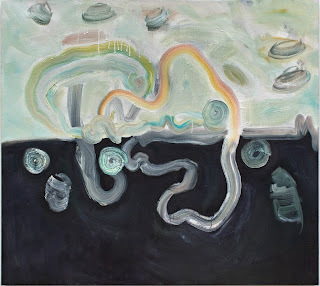 Also this afternoon, if you prefer art, Bleicher Gallery holds a panel discussion to mark the closing of Julia Schwartz’s solo exhibit The Hollow Sea. Psychoanalyst Judith Vida-Spence and critic Shana Nys Dambrot will open discussion from their unique areas of expertise. Shana Nys Dambrot is a critic, curator, and author. She is currently an art writer at LA Weekly, Los Angeles Editor at Whitehot Magazine, and editor of LA Canvas magazine. 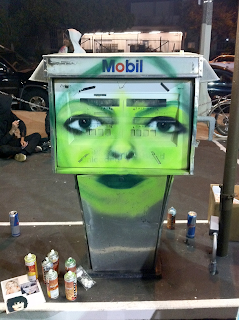 There are a couple more in Culver City…that will be up for the Weekend Update, till then.